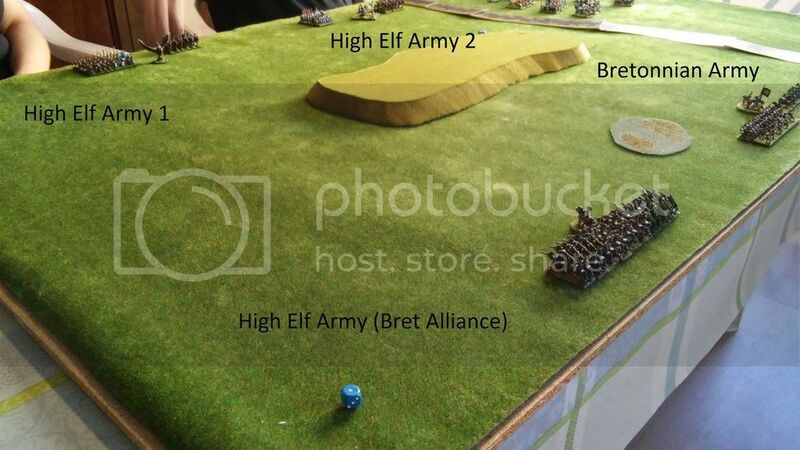 Four player battle played between Mr. and Mrs. Brutalrage (playing two 1K HE armies) against and friend of mine and me (playing 1K HE and 1K Brets). - The main goal was to take the hill in the middle of the table. - BP rules apply as per usual rules. 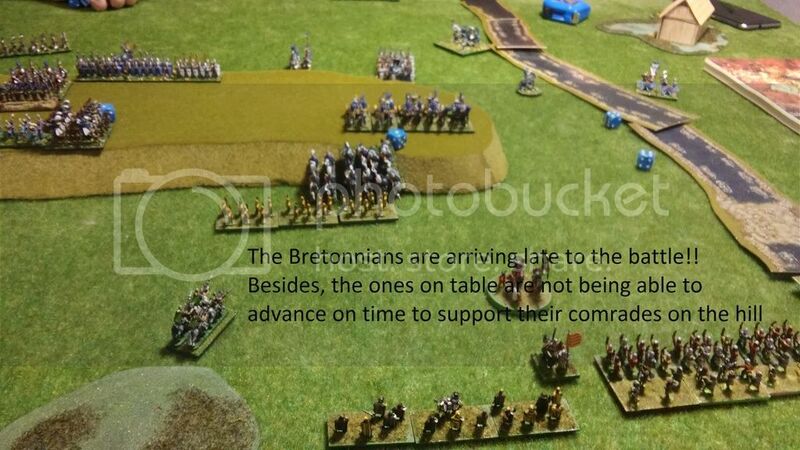 - In the first turn each army deploy 1D6 units. 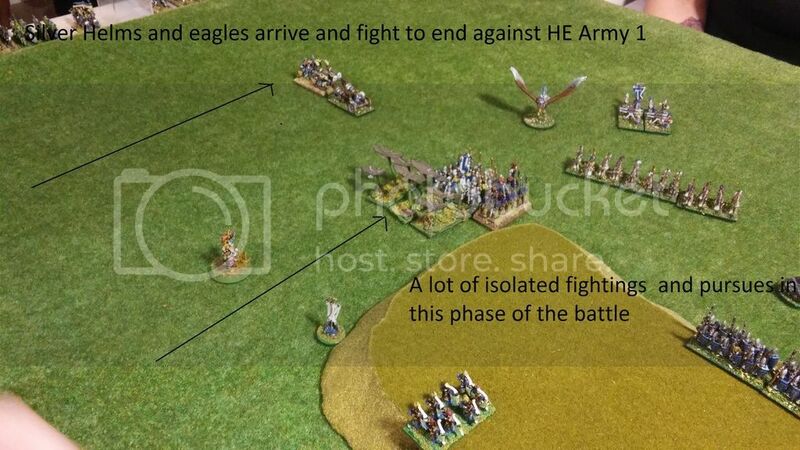 Each additional turn arrive on each table edge 1D6 units per army until all units arrive in the game. 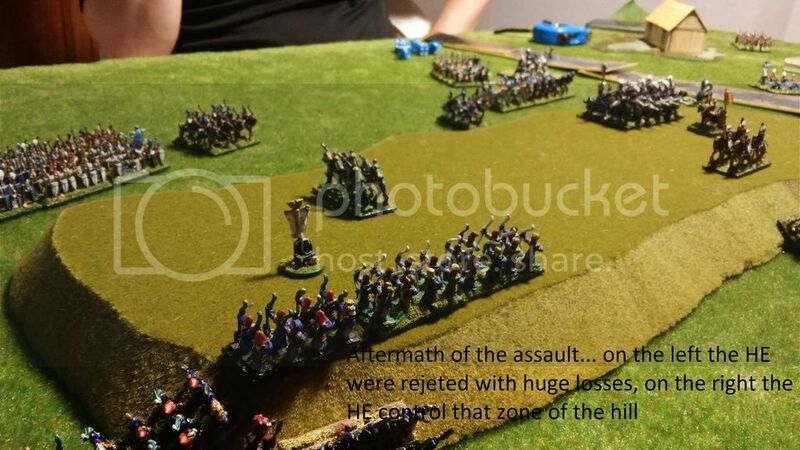 - We decided to play in a small table, to help all units reach quickly the slaught... ehm.. I mean, the hill. 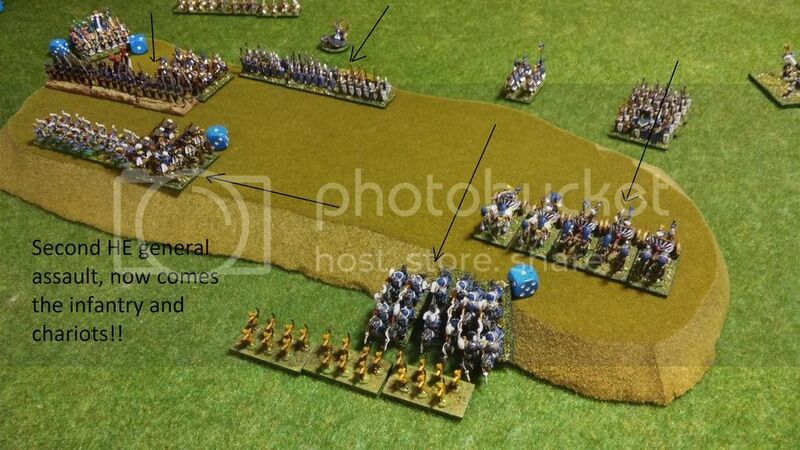 As expected it was a furious game, running forward and holding positions until reinforcements arrived. 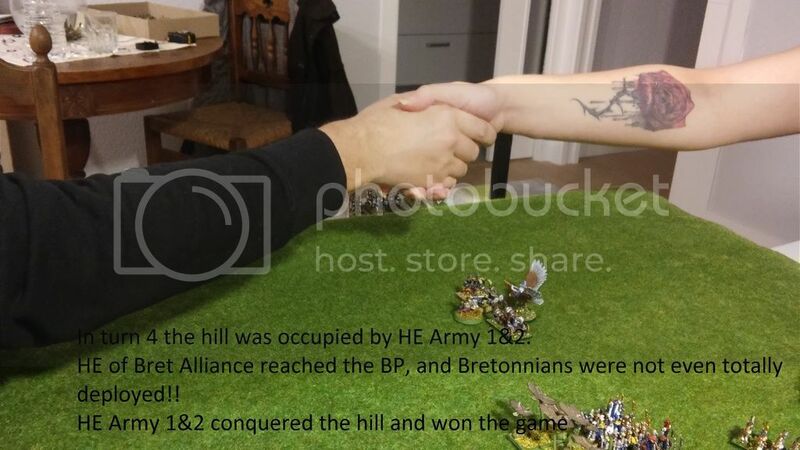 A lot fighting would be on the hill. 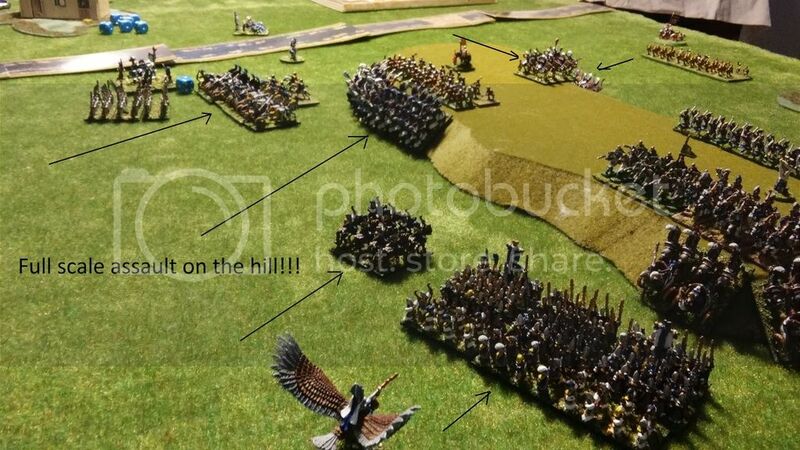 The most "wild" parameter was the 1D6 units per turn, that relied a lot on luck, but prevented to be a typical "all units at the same time" to the get the hill and tried to reflect the gradual coming (or not coming!) of reserves to the battle. All in all the objective was to have a fun game. 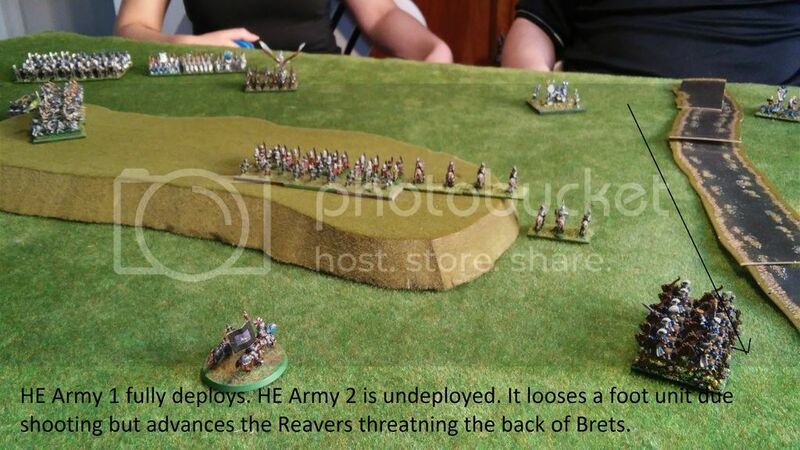 The HE+Brets moved quickly to occupy the hill but were expelled by the bigger army HE assaults. 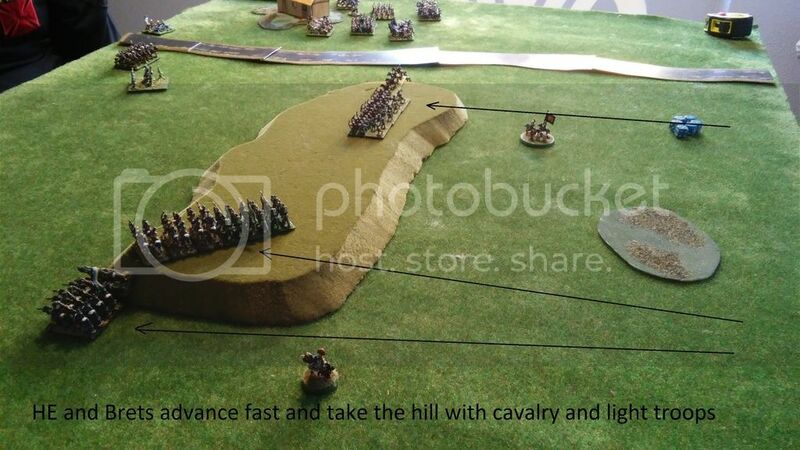 Our plan was to get to the hill fast with cavalry and archers, hold until the HE and bret get to the hill and in a third phase attack the flanks with cavalry. That did not happened. HE launched the cavarly and chariot and pushed through the centre, although HE Army 1 suffered many casualties in the process. Note: all photos posted with permission. 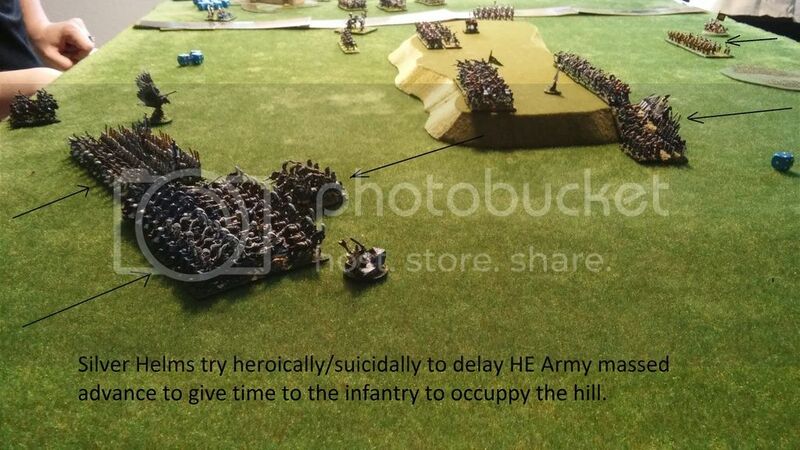 "You know, one time we had a hill charged by Silver Helms, Spearmen, Chariots and Wizards with Fireballs, for 12 hours. When it was all over, I walked up. We didn't find one of 'em, not one stinkin' dink peasant Bretonnian body. The smell, you know that smoke smell, the whole hill. Smelled like... victory. Someday this war's gonna end..."
Distracting the enemy eh? Good tactics. Good stuff! I hope that other people looking were interested in the game!